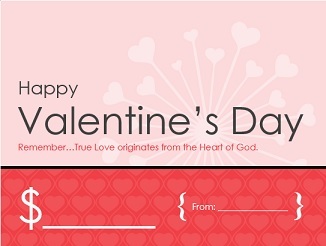 These for Valentines Day like the one to the right will help you show appreciation to your church staff, church members, Sunday School children or you can use for personal use to show your special someone in your life just how much you appreciate them. These unique beautiful Valentines Day Gift Certificates below are wonderful way to celebrate Valentines Day with your church or the with the Love of Your Life! If you are in hot water and forgot about Valentines Day then a gift certificate is usually a quick fix that can save your life, especially when it comes to the love of your life. Gift certificates are a wonderful and popular gift on Valentines Day because you can give them money to their most favorite place to get exactly what they want. By giving a gift certificate, you make it possible for them to purchase that particular product or item that he or she really wanted. You can use these gift certificate templates to include any type of gift depending on what you would like to give to the recipient. Most of the time, people like to give gift certificates to a coworker, friend or loved one that already has everything they need and you this saves you the embarrassment of not getting them something that they already have. Valentines Day is a very special holiday where you want to be sure and get the right gift. So whether you give that special someone in your life a gift certificate, money, chocolate, card, letter, coupon, candy, craft, big kiss and hug...just be sure that through your gift you are showing that special love that you have especially for that person. Return to Valentines Day Ideas from Valentines Day Free Gift Certificates.